The EL series by Exlar are explosion-proof actuators rated for Class 1, div 1, Groups B, C, and D. These actuators are suitable when the air may contain flammable vapors in concentrations high enough to create a risk of a explosive or ignitable atmosphere. Group B includes atmospheres where hydrogen or similar gases, such as manufactured gas, may be present. Group C includes ethyl-ether, ethylene or cyclopropane. Group D includes atmospheres where gasoline, alcohol, acetone, butane, hexane, naphtha, benzene, benzol, lacquer solvent vapors, or natural gas may be present. EL series actuators are not recommended for acetylene atmospheres. The Exlar EL series features roller screw technology, converting servo motor motion into linear motion control. Threaded helical rollers disposed around a central shaft in a planetary type construction provide high load capacity for thousands of hours in high demand environments. 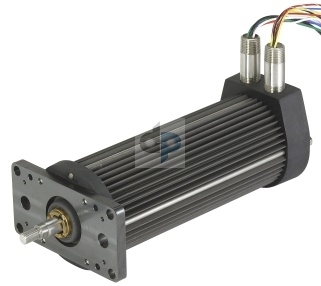 The brushless servo motor of the EL series is compatible with advanced closed loop systems, providing a highly dependable linear motion control solution when speed and position control is critical. The motor housing is sealed to protect components from atmospheric contaminants, and the seal mechanism on the extending rod prevents the intrusion of abrasive contaminants. The EL series is a highly reliable actuator suitable for replacing existing hydraulic units. The EL electric actuator provides high repeatability, precision speed and position control, and much higher efficiency than hydraulic systems. The Microsoft Windows-based control program simplifies installation and operation, featuring easy slide bar controls for tuning the motor and setting valve commands. The EL series offers easier installation, less maintenance, and lower overall cost than hydraulic actuator systems. AA = Frame Size XX1 = Custom Feedback Mount - purchaser must supply drawing of feedback device and desired wiring drawings. 1. Preloaded follower option is not available with absolute internal feedback options. The dynamic load rating of preloaded screws is 63% of the rating of non-preloaded screws. Travel life of preloaded screws is 25% of non-preloaded screws of same size in same application. 2. Kollmorgen ServoStar series amplifiers require motor data files for operation with EL Series actuators. These files can be downloaded. Inquire with Exlar applications engineers for details. 4. Use of the Allen Bradley 1394 requires assistance from Allen Bradley to configure the axis for a custom motor.